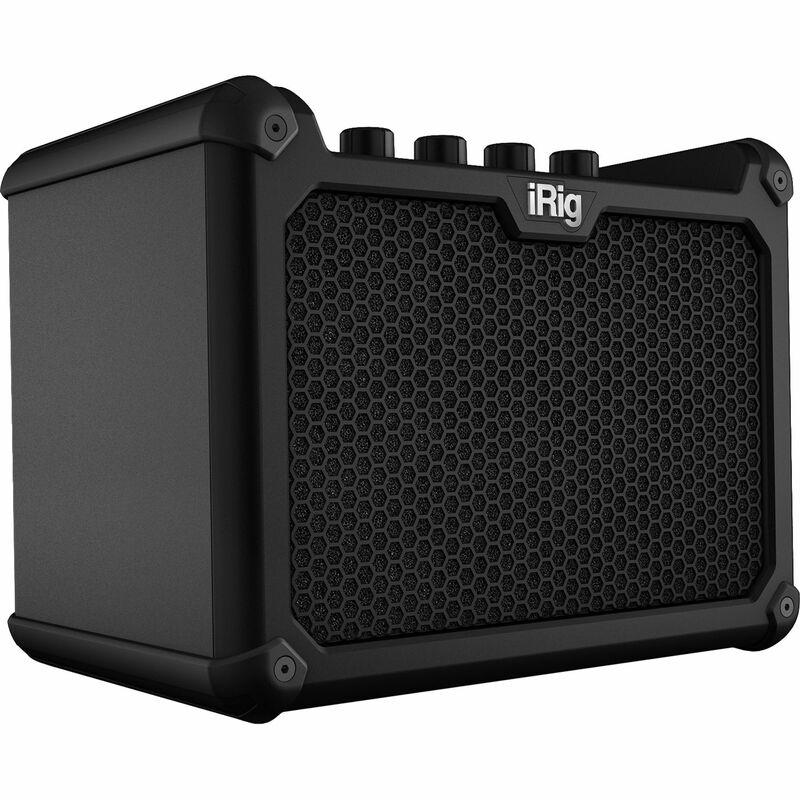 Designed for electric guitar players, the iRig Micro Amp from IK Multimedia is a small combo amp that can deliver 7.5W when battery powered and 15W when plugged into a wall. It does all of this through its custom-voiced 4" speaker, making it a louder than the little package lets on. It also gives you three channels of varying distortion: clean, drive, and lead. On the amp itself, you'll find controls for gain, bass, mid, treble, volume, and channel selection. Plug-in your headphones, or loop in your favorite mobile device through 3.5mm I/O located on the top of the amp, right next to the 1/4" instrument input. Want to power a louder speaker? You can do so through the 1/4" speaker output on the rear of the amp, which can handle impedance loads between 4 and 16 Ohms. Pair the amp with your iPhone, iPad, Mac, or Windows Machine, and you can make use of many AmpliTube amp/cab simulations, which are often utilized in the creation of records. 10 amps and 26 stompbox models form the included AmpliTube CS app can be used with this amp. If you're using a computer, you can play through nine amps and 10 stompbox models. More amps, stompboxes, and rack effects can be secured from IK Multimedia. Some include licensed recreations of Fender, Mesa Boogie, and Orange amplifiers, as well as the rigs of Jimi Hendrix, Slash, and others. Thanks to the micro-USB connection you can interface with software apps as well as your computer's DAW. So, you can use the iRig Micro Amp to busk on the street, then take it into your home studio to record right into your computer. The combo amp comes with a lightning to micro-USB cable, a USB Type-A to micro-USB cable, a thread for mic stands, and six AA batteries. A dedicated power supply is available separately. iRig Micro Amp unlocks 10 amps and 26 stompbox effects in AmpliTube CS for iPhone or iPad, and includes AmpliTube 4 for Mac/PC for 9 amps and 10 stomps. Box Dimensions (LxWxH) 10.9 x 8.7 x 7.4"